I was laying down next to my boy the other day, elbow on my pillow, cheek resting on my rounded fist, watching him breathe in and out. How he wore a button down shirt and tie to church on Sunday. Only we didn't leave the house for church because baby girl was sick and we decided to have "church" at home. But our Whit, he would choose a shirt and tie for "home church" but never for "go the building church". Strong, independent, do-it-his-own-way and how I'd change him if I could so the angels stomp and shout that I, Master Celebrator of Convenience and Ease and Practicality, can't touch that spirit within him. How the cut above his eye from a Play at Your Own Risk family room pillow fight bears witness that little boys live here and that pillows aren't for sofas or making pretty but for war. Rowdy, rambunctious, so much energy, so much unapologetic zip and zing. How my life is never serene. How wild life reigns here. How blond tresses, heading this way and that, won't be contained - just like his three year-old spirit - all. day. long. - because in-place is not as cool or adventurous as all-over-back-and-forth and his hair and three year-old body tell the same story: We are dapper and free. They are made for each other. How he wears a goatee of leftover Oreo cookie and can't be bothered with face washing or cleaning up - not when the promise of naptime in Mama's bed is waiting upstairs. How I've given in to this simple request because he naps long and hard here and I've learned that choosing my battles, one by one and different for each of them, creates a freedom I didn't know when I was newly Mama. How I've let go of what doesn't matter, so I can hold on to who does. How pinwheel sheets - the ones that we picked out when we were engaged are still hanging on - just barely. How they cup the head of my sleeping boy now but how they could tell a thousand stories of their own of how two sinners come together to love and cherish and create a family and how we've hashed out our dreams and disappointments laying stubborn on the edges and how tears have fallen, heart-soaked, onto the pillowcases. In joy and in sorrow. Plenty and want. Sickness and health. And, all of this, swept into just one moment, proclaiming in living color how God's penmanship on our lives is so powerful and vivid that our life stories can be told and retold in everyday living. On everyday things. 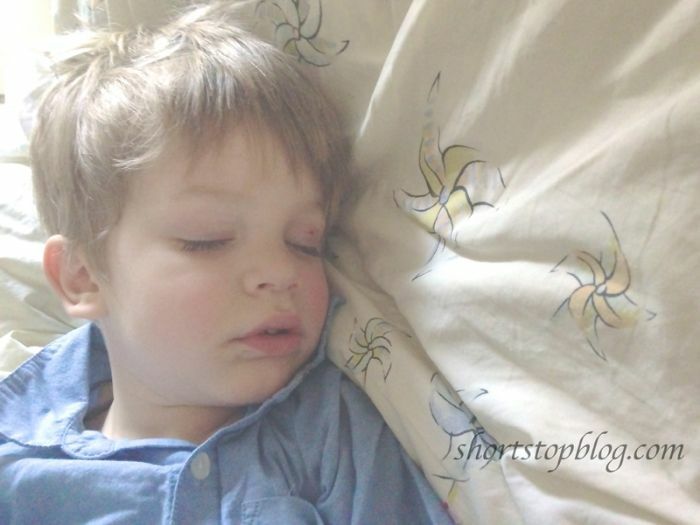 On sleeping boys with pillow fight tattoos. If only we pause long enough to soak it in. "How I've let go of what doesn't matter so I can hang on to WHO does" Sarah....thank you. Today is my baby's first birthday. My last of the firsts. Yesterday, the kiddos and I were stringing pictures together for her celebration, and we were giggling (and tearing up) over our beautiful, full year. But I couldn't help but wonder if I was there for all of those moments. Of course I was there, they were snapped on my phone....but was I THERE. I could not remember some of them, and it killed me. How many times was I thinking about what needed to happen next, that I was missing what was happening here and now. Her year in instagrams......who knew a little square could bring me to my knees.